The amount of amp-hours (AH) a battery can deliver when discharged at a constant rate at 80?F (27?C) for the 20 Hr and 100 Hr rates and 86?F (30?C) for the 5 Hr rate and maintain a voltage above 1.75 V/cell. Capacities are based on peak performance. Dimensions are based on maximum size. Dimensions may vary depending on type of handle or terminal. Dimensions taken from bottom of the battery to the highest point on the battery. Heights may vary depending on type of terminal. 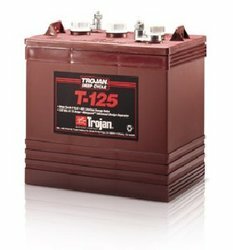 * Due to some State laws, Municipal and County ordinances , batteries may only be delivered to a commercial address. "Go out into highways and countryside and urge everyone you find to come in, so that the house will be full. ?